Psuedo-ecclesial pretenders from the non-canonical, so-called "Orthodox Church of Montenegro" are continuing to lay claims on the property, churches and monasteries of the Serbian Orthodox Church on the territory of Montenegro. The leader of this organization, Miras Dedeic, who is identifying himself as "Metropolitan Michael", has announced this once again. Miras Dedeic - "Metropolitan Michael"
On New Year’s Eve, Dedeic again expressed the thought that the Church property on the territory of Montenegro had been supposedly taken away and given to the Serbian Orthodox Church illegally, and expressed his regret for the "humiliating status of the Orthodox Church of Montenegro". Unfortunately, such statements are supported by Montenegrin politicians, wanting at all cost the creation of an autonomous Church structure, separation of the Orthodox population of the country from the Serbian Church, and ultimate formation of the new Montenegrin identity, which contradicts the way of life that has existed in Montenegro for many centuries. Dedeic expressed his hope that in the new year, politicians would make the decisions which would improve his organization's status. "I believe, it will be one of very important and very serious issues, which representatives of our authorities and state will decide. 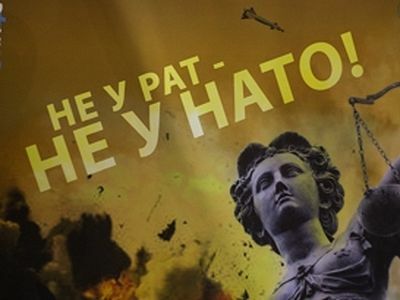 I feel certain they will make a right decision, which will open a faster way to the European Union and NATO," cites the Montenegrin edition Pobeda ("Victory") the words of the "metropolitan". At the present time there are four dioceses of the canonical Serbian Orthodox Church on the territory of Montenegro, which give spiritual guidance to the overwhelming majority of the country's population. 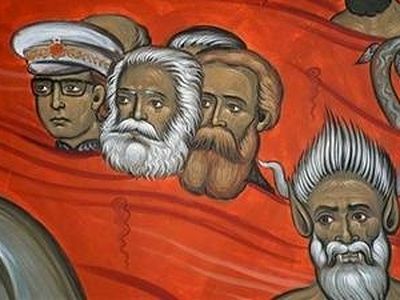 Look up at the wall and you can see Yugoslavia's late autocratic leader Josip Broz Tito drowning in red fiery waves of hell - along with Karl Marx and Friedrich Engels, authors of the 1848 Communist Manifesto.